Time For A Healthy Lifestyle? Living a healthy lifestyle is the in thing these days. Theoretically, I totally understand and agree with these principles. My problem is in the execution. While I do not really see my lifestyle as "bad," I know that there are a lot of areas which I can work on. Now why am I suddenly in this healthy mode? You know I have been seeing the OB regularly for my PCOS and that she had me see a nephrologist. 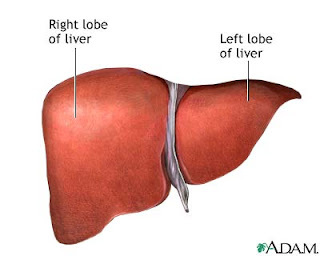 I had my ultrasound done today, to check on my kidneys and according to the person who did the ultrasound, there is a spot or a mass in the right lobe of my liver. Since she was supposed to check on the kidneys only, she didn't record the image of my liver but was insistent about me asking my doctor to request a liver ultrasound. I don't drink much alcohol, I really don't. I can even live without it! Now it may be nothing but that med tech was quite concerned, and I couldn't help but feel the same. I guess I have to mention this to the doctor when I come in on Tuesday. Is it my lifestyle or am I just getting old? Oh, the good news is that I don't seem to have any kidney stones although the right kidney is "dilated." Thank God for small favors! [UPDATE] I have been reading up on "liver spots showing up in an ultrasound" and it seems that this is fairly common. A lot of people have had this problem, the difference lies in what the spots mean. I guess I have to have an MRI or something like that to find out. Many cases turn out to be benign masses, so am hoping for that! hay buti naman no kidney stone. Lifestyle change nga lang ata kailangan. BTW may "biggest loser" contest sa office nila Mark. Syempre sasali cya. Hehe. Good push to a healthier diet sa aming lahat.